You are here: Home / Articles / Tech Solutions / My Keyboard Is Making the Wrong Symbols! My Keyboard Is Making the Wrong Symbols! 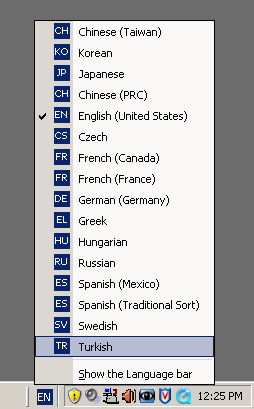 If you have multiple languages or keyboards configured through the Windows Keyboard and you find yourself pressing characters on the keyboard but having different characters display on the monitor, check the language bar. Sometimes it can be very subtle. If you entered a different language letter, it would catch your eye immediately. A lot of times, however, the letters will be the same but be in a different location on the keyboard. Punctuation seems to be the most common change; typing a semi-colon results in a parenthese, etc. There is a good chance that the language has switched from English or your usual keyboard setup. The buttons are then entering correct information, it’s just not the information you want. Simply click on the language bar or its minimized form (the blue square with two letter initials) and then click on the language you want from the menu that pops up. “How did this happen?” you say. Well, if you didn’t change it, how come it is no longer English (or your language of choice)? The keyboard shortcut Alt+Shift can also be used to cycle through this list. Thus it seems that most likely a mistype of those buttons is the culprit for why you’re now typing in Swedish.